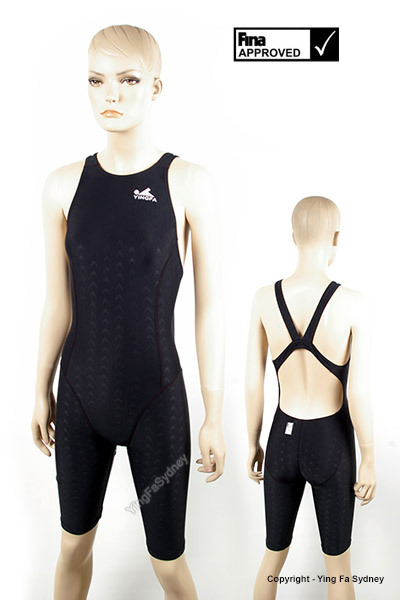 Note: A tightly fitting swimmsuit, or 'compression', is a key characteristic of competition swimwear. Bra / Bust support is not part of the design for racing swimwear. A tight fit across the chest creates a more streamlined silhouette for the swimmer, reducing drag and increasing glide times. SUPER SPECIAL - $50.00 until sold out. Discontinued. Limited Stock. No rainchecks, returns or exchanged due to change of mind. This is a fashionable knee length racer. It has been designed for both performance and style. 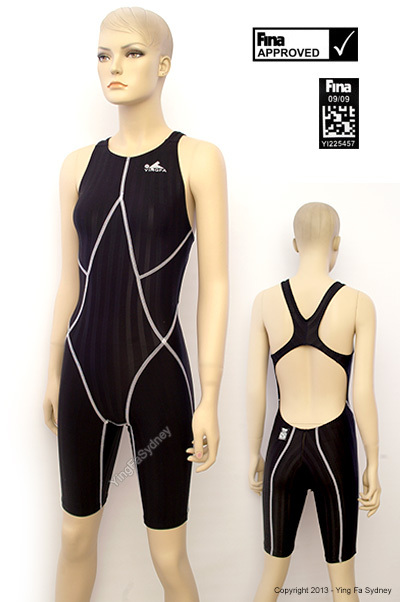 This suit has all the features you expect from a Yingfa racer to aid performance, the material, the stretch and the mesh seam at the rear. 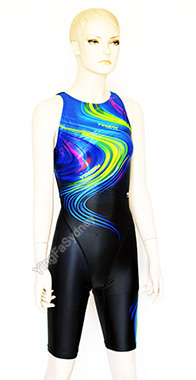 The suit has been digitally printed with a black back ground and a colourful swirl pattern on the body and a leg. This suit is not lined. This suit is NOT FINA APPROVED. The excellent Yingfa material lets this suit cut through the water to improve your glide due to the teflon coated fibre racing material used. This suit is not FINA approved. This suit is black with blue stitching along the seams with a blue to green patterned insert. The suit extends to the knee. The excellent Yingfa "sharkskin" material lets this suit cut through the water to improve your glide due to the teflon coated fibre racing material used. This suit is not FINA approved. This suit is black with white stitching along the seams with a hot pink insert. The suit extends to the knee. The suit has been digitally printed with a lion's face on the chest, white seam stitching, grey side panel and a colourful logo printing on the left leg.